Debby spent 12 days walking in the Cotswolds in England, an "Area of Outstanding Natural Beauty." This book (above) is a collection of over 375 photographs, in 192 unnumbered pages, of Debby's favorite subject when she travels - windows and doors - reflecting the quintessential contrasting and complementary colors of the flowers and plants that literally grow on and climb the walls of the honey- and golden-colored Cotswolds Stone of the buildings, homes, and churches. The Cotswolds is particularly famous, apart from the wonderful ancient villages, for its outdoor activities including countryside hiking walks and importantly the famous Cotswold Way Walk from Chipping Campden to the City of Bath. You will also find a multitude of activities to suite all tastes including Golf, Fishing, Horse Riding, Ballooning, Gliding, Motor Sport, Cycling, Pottery Making, Study Breaks. See below for further details. The Cotswolds region of outstanding beauty is a paradise of rural tranquility and offers many outdoor activities including walking and hiking, cycling, horse riding, golf, motor sport, gliding, ballooning, fishing, camping, caravanning, or just ambling around and through the many beautiful villages. Chipping Campden to Broadway (6 miles) or to Winchcombe (18 miles). Winchcombe to Dowdswell Reservoir, Cheltenham (12 miles). Cheltenham to Painswick (17 miles). Painswick to Uley (17 miles). Uley to Hawksbury Upton (17 miles). Hawksbury Upton to Cold Ashton (16 miles). Starting at the historic border crossing at Chepstow, the Gloucestershire Way offers a 100 mile walk, mainly on footpaths and bridleways, through this most English of landscapes. Above all, the walker gains a unique perspective on the Cotswolds. Firstly, from the Forrest of Dean, the Cotswolds appear as a distant 'High Blue Hill', next the Way leads through some fine villages, before the descent to the landmark Abbey at Tewkesbury. New walk from Stratford-upon-Avon to Shakespeare's Globe Theatre on Bankside, London. For detailed information see Shakespeare's Way Walk . Discover the Cotswolds set amidst gentle rolling countryside and enjoy Somerset with its picturesque Mendip Hills. Also the beautiful Wiltshire Downs and its heritage together with the contrasting scenery of Exmoor with its coastline, heather moors and wooded combes. We also have experience in arranging individual walking club itineraries to suit your organisation - please enquire about our special rates. 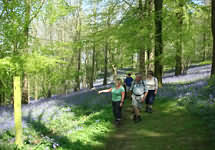 We are now in our 20th year and we personally lead all guided walks. There are over 3000 miles of public footpaths in the Cotswolds Area of Outstanding Natural Beauty. The Cotswolds is renowned and a well used destination for walking through the open 'Wold' countryside on the 3000 miles of public footpaths. Public rights of way are well maintained and signposted and the area has one of the best kept 'rights of way' networks in the UK. The Cotswolds Area of Outstanding Natural Beauty also contains a number of national and regional walking routes such as 'The Cotswolds Way Trail', 'Macmillan Way' and 'Oxfordshire Way'. Circular routes withy self-guided leaflets are also plentiful. Treat yourself or a loved one to one of our self-drive classic cars for great days out or short breaks in the Cotswolds. What could be better than taking a leisurely cruise in a classic car around the picturesque country roads of this Area of Outstanding Natural Beauty? With its breath-taking scenery, chocolate-box villages with pretty honey-hued cottages, traditional pubs, and historic attractions, there couldn’t be a more pleasant way to spend the day. Based in Witney, near Oxford, we are ideally situated to hire a classic car in the Cotswolds. We are just a few minutes’ drive away, with easy access via the A40. 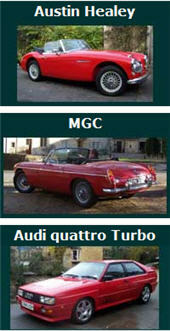 Choose from an AC Cobra replica, an MGB Roadster or a Jaguar E-Type coupe. Experience the thrill of motoring in a real ‘drivers’ car. Relax into the leather seats, admire the nostalgic interior, feel the handling through the steering wheel and listen to the music made by these beautifully crafted engines. Turn heads as you glide by, this is what classic motoring is all about. Cycling is a great way to soak up the true atmosphere of the Cotswolds beautiful countryside and idyllic villages, not to mention the lazy lunches at the wayside inns. There are a number of cycling centres in the region including Moreton-in-Marsh, Bourton-on-the-Water, Cheltenham, and Bath. Further details will be published on this website in the near future. For cycle hire see - Cycling in the Cotswolds. Fly out of Gloucester Airport…. Fly all over the world….The Sky is yours! 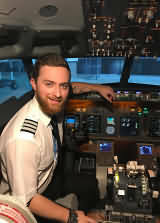 Choose your Flight Experience from the Flight Sim Shop. 45, 60, 90 or 120 Sim minutes. Ther eis a detailed description on each flight. You can add Gate to Gate and a Video from the Add-on section to make this a truly memorable occasion! Your Exciting experience will start with your arrival at our reception area, where we will book you in and introduce you to your pilot instructor for the day. Nympsfield, Stonehouse, Gloucestershire, GL10 3TX. Cotswolds Hills golf Club, Ullenwood, Leckhampton, Gloucestershire, GL53 9Q. Tel 01242 515264. 18 hole with scenic views. Visitors welcome by appointment. Handicap certificates necessary. Lilleybrook Golf Club, Cirencester Road, Cheltenham, Gloucestershire. Tel 01242 526785. 18 hole parkland course - visitors welcome weekdays only. Handicap certificates necessary. Minchinhampton Golf Club - Old Course, Minchinhampton Common, Stroud, Gloucestershire, GL6 8BE. Tel 01453 832642. 18 hole course on common land. One of easiest west country courses and played over a variety of humps and hollows. All welcome. The Wychwood Golf Club - Lyneham, Near Chipping Norton, Oxfordshire OX7 6QQ. Tel 01993 831841. We now have two separate courses covering an area in excess of 120 acres. Anchor Course - Par 64 – approx 5000 yards. An 18 hole course with holes ranging from 133 to 413 yards (Par 3s, 4s and 5s). Nestling alongside the banks of the Warwickshire Avon, the wildlife and scenery make the course a pleasant amenity. The course is flat with mature hedgerows and trees. The design is intended to create a degree of difficulty without becoming too onerous to walk round. The price for 18 holes is £12.50. Buggies can be hired on the Anchor Course for £12 - please ring 01386 871017 or 07947485621 to book buggies. A well established and maintained 9 hole pay and play genuine short course with holes ranging from 131 to 200 yards. The price for 9 holes is £7.50. Club and ball hire is available. Golf lessons by arrangement. Ideal for beginners and Pro's wanting a casual round. No membership required – although we do now offer membership. See our website www.harvingtongolfcentre.co.uk for full details. We've got your helmet ready .... so what are you waiting for! Our authentic gravel rally driving track is located between Swindon and Cirencester on the Gloucestershire Wiltshire border. We run regular open sessions – either half or full days – so you can book a place or two and come along to try your hand in the company of a group of like-minded petrol heads. Cotswold Off Road Driving School is operated by GwynneSpeed who has been running a successful Rally Driving School in the area since 1994. GwynneSpeed is a market leader in providing fun, exciting, safe rally days to members of the public as well as corporate clients and is now delighted to turn it’s hand to the challenge of off-road driving. With guidance from current 4×4 competitors and instructors, our course has been designed to challenge drivers in a safe, controlled environment. Prescott Speed Hill Climb, Bugatti Owners Club, Prescott Hill, Gotherington, Cheltenham, Glos. GL52 9RD. Tel 01242 673136. www.bugatti.co.uk. The Bugatti Owners’ Club was founded in December 1929 for enthusiasts of the Bugatti car. Prescott Hill Climb, near Cheltenham, is the club’s home and provides members and spectators with motor sport at its very best. For events throughout the year see Cotswold Calendar. CHIPPENHAM, WILTSHIRE, SN14 7EY. The circuit boasts modern facilities for competitors and spectators, and the resurfaced and now reshaped circuit providing what is generally recognised as providing the closest circuit racing in British motorsport. Silverstone Motor Racing, Towcester, Northamptonshire, NN12 8TN. For more than 60 years Silverstone has carved its mark as one of the leading motorsport venues, creating a powerful heritage around the world. Internationally renowned as the host of world class events, Silverstone is also famed for its exhilarating driving experiences, sumptuous corporate entertainment and prestigious conference facilities. W: www.silverstone.co.uk. Silverstone is outside the Cotswolds on the eastern edge and approx. 30 minutes travel away from Banbury by car. Whitecliff Off Road Driving Centre, Whitecliff Quarry Coleford, Glos GL16 8NB. Tel 01594 834666. Bristol and Gloucestershire Gliding Club, Nympsfield, Stroud, Glos GL10 3TX. Flying available all year round. Cotswold Gliding Club, Aston Down Airfield, Nr. Stroud, Glos. Tel 01285 760415.Trial lessons and holiday courses. Chad Lakes Fishery, Bledington, Nr Chipping Norton, Oxfordshire, OX7 6XL Tel 01451 831470. Course fishing set in the heart of the Cotswold countryside. Lemington Lakes, Todenham Road, Moreton-in-Marsh, Glos GL56 9NP Tel 01608 651872. Set in 75 acres, course fishing and big carp. The Willows Isis Lakes, South Cerney, Glos GL7 5TL Tel 01285 862898. Wood lodges, 18 hole golf course, course and trout fishing. The Lenches Lakes, Hill Barn Orchard, Evesham Road, Church Lench, Evesham, Worcestershire, WR11 4UB Tel 01386 871035. Two lakes offering 7 acres of water. Trout Fly fishing. Lechlade and Bushyleaze Trout Fishery, Lechlade, Glos GL7 3QQ Tel 01367 253266. 9 acre lake and 250 yards of wild brown trout fishing on the river Leach. Bushleaze, at 22 acres, has a minimum stock size of 2.5 lbs. Both waters ideal for corporate events. Whether you’re a specialist after barbel (to 15lbs 8oz) or chub (to 6lbs 1oz), a matchman or just a pleasure angler Manor Farm near Evesham has exactly what you’re after. We have 100 pegs on a prime stretch of the Warwickshire Avon plus seven well stocked still waters. Cheltenham Balloon Flights, Yew Tree Farm, Woodmancote, Cheltenham, Glos Tel 01242 675003. Hot air balloon flights everyday. Welcome to Hands on Bushcraft; wilderness bushcraft and survival school, offering a fantastic selection of bushcraft and survival courses teaching various survival skills from around the world. We pride ourselves on high quality value for money courses which are realistic, enjoyable and practical. If you enjoy taking part in outdoor activities and breathing in the fresh air, then why not join us around our camp fire on one of our bushcraft courses, where you can experience the rich natural beauty of Gloucestershire, Wiltshire and the Cotswolds. 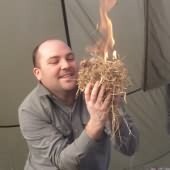 We also offer bespoke bushcraft courses, tailor made especially for you. a stag do or corporate team building course, we can make it happen. www.rsc.org.uk for information on current programme. For information about Stratford upon Avon theatres. Take part in this very popular pastime of learning to Dry Stone Wall using ancient skills under the guideance of Cotswold Craftsmen. You can either volunteer, pay for a course that suites your needs or take a working holiday..
Hartpury College, Hartpury House, Hartpury, Gloucester GL19 3BE. Wesite - www.hartpury.ac.uk. Tel - +44 (0) 1452 702132. Stroud College, Stratford Road, Stroud, GL5 4AH. Website - www.stroud.ac.uk. Tel - 01453 761155. BritishTrust for Conservation Volunteers, BTCV Gloucestershire, Tithe Barn Centre, Brockworth, Gloucester, GL3 4QU. Website - www.btcv.org. E-mail - glos@btcv.org.uk. Tel - 01452 864805. Gloucester Vale Conservation Volunteers. Website - www.gvcv.org.uk. E-mail - info@gvcv.org.uk. For detailed information on Cotswold Dry Stone Walls. The Cotswolds Area of Outstanding Natural Beauty has a network of dry stone walls at least equivalent to the length of the Great Wall of China. There are approx 4000 miles of dry stone wall in the region. Visit famous gardens in and around the Cotswolds. Croft Farm has become well known as a windsurfing and sailing centre with a RYA recognized school and modern hire fleet. Kayaking and canoeing take place on the lake and nearby River Avon. The lake is open all year for people with their own equipment on a day or season basis. Ideally situated on Lansdown Hill overlooking the picturesque Roman City of Bath, Bath Racecourse is the highest racecourse in Britain and is known for being intimate, relaxed and friendly. For more information on: Bath Racecourse including events. Cheltenham horse racing is a great day out for all. There are three enclosures to choose from and from wherever you are guaranteed stunning views of all the racing. 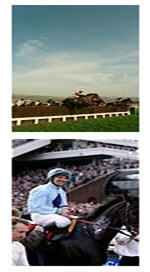 For more information on: Cheltenham Racecourse including events. Set in the middle of picturesque Wiltshire countryside, within view of stunning Salisbury Cathedral, the Racecourse hosts 16 thoroughbred flat race meetings in 2008, plus a raceday for Arabian horses. For more information on: Salisbury Racecourse including events. For more information on: Stratford-upon-Avon Racecourse including events. Lying just a few hundred yards from Warwick Castle, Warwick Racecourse retains its historic charm and character. The racecourse is one of the oldest in the country, with racing having taken place here since the 1740's, this is a course rich in tradition and heritage. For more information on: Warwick Racecourse including events. For more information on: Worcester Racecourse including events.